Ben and I at Blue Mounds enjoying some of the best snow we have had in many years, in fact the report is official we have received a total of 75 inches with another round coming this way, thats over 6 feet of snow people. And as if the skiing isn't hard enough I refuse to buy a snow blower so as to increase my overall physical destruction. Did I mention we live on a corner lot so when we get snow like this I get a great workout. 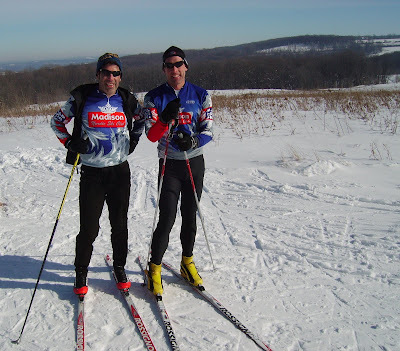 Me and the gang getting our wax ready for the second highest peak in Wisconsin, on this day we skiied about 25k. After Ben and I came home we grabbed the girls and headed out for a little flatter terrain. Terry, Ben, and my wife Jill. This is a great 10 k flat loop that Ben and I skied the day before, just double polling, (all upper body).